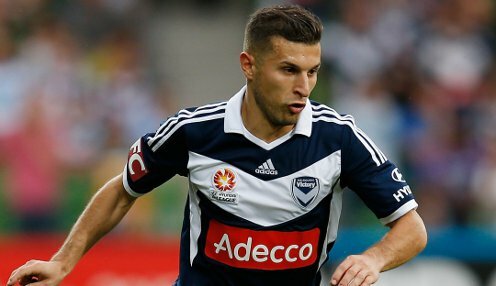 Kosta Barbarouses' double got Melbourne Victory back to winning ways as they saw off Brisbane Roar 2-1 at Marvel Stadium. It ended a six-match winless run in all competitions for the defending champions and brought them within a point of second-placed Sydney FC. He was in our opinion the right choice to give us the best chance of success. The Roar have had no answer to New Zealand international Barbarouses this season - his brace meant he's scored seven goals against his former team and 13 overall. Kevin Muscat's team had only taken two points out of a possible 12 in the league going into the match to slip back in the chase for the minor premiership. They got things right against the second-bottom side, though, with Barbarouses giving them the lead in the 24th minute when he capitalised on Keisuke Honda's fifth league assist of the season by going around keeper Brendan White from a one-on-one situation. He doubled Victory's lead six minutes before half-time as he volleyed home from James Troisi's pass over the top - the goal was given after the video assistant referee (VAR) overturned an offside call. The Roar replied early in the second half, Eric Bautheac chipping Victory keeper Matt Acton after a turnover deep in defence. Barbarouses was denied his hat-trick just after the hour mark, before Raul Baena forced White into a save. In injury time Kenny Athiu's flick from a Rahmat Akbari cross hit the post to spare the Roar a third goal. Muscat had caused a surprise by dropping keeper Lawrence Thomas, who has been the club's number one since the start of the 2016-17 season. "We need better from Lawrence and he has got to fight for his place," said the coach. "The decision was more about Matt Acton; I selected him based on everything that we have seen. He was in our opinion the right choice to give us the best chance of success." Melbourne Victory are 7/2 to win their next game against Perth Glory, who are 7/10 with the draw 3/1. Victory are 14/1 to win 1-0.